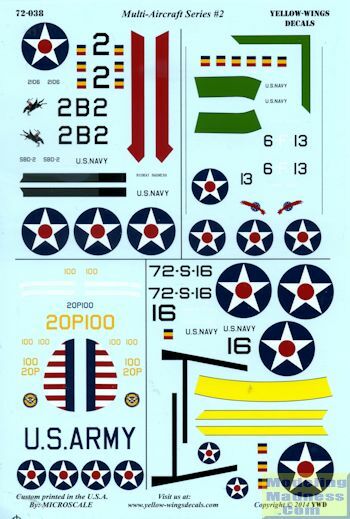 Yellow Wings Decals 1/72 sheets are not all that common, so it was nice to see their second '4x4 series' sheets. These combine four different aircraft on the same sheet, a great idea for those who want to build different aircraft types from a single sheet. 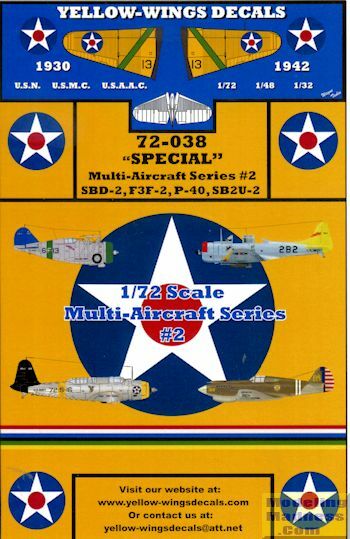 It has been over two years since their last 1/72 sheet so this one is most welcome. No kits are specified for this sheet, but they are out there. First up is a nice F3F-2 from the USS Enterprise in 1937/38. THis aircraft has a green cowling and fuselage band as well as the upper wing chevron. The empennage is in True Blue. The rest of the aircraft is aluminum paint save for the upper wing which is orange/yellow. Next is an SBD-2 from the USS Lexington during early 1941. This has the yellow empennage along with a red wing band and a red upper cowling. This one also is a 'yellow wing' plane with an aluminum airframe. This is a painted aluminum lacquer, not bare metal. The fourth option is an SB2U-2 Vindicator from the USS Wasp in 1941. It has the black empennage of the Wasp air wing along with a yellow forward cowling, fuselage stripe and wing chevron. The rest of the airframe save the orange-yellow wing is in painted aluminum. Finally, the only non-USN subject, a P-40B from the 55th Pursuit Squadron in 1940. This one is in OD over Neutral Grey with a white spinner and two white fuselage bands. Typical of pre-war USAAC planes, it has the red, white, blue rudder. The sheet is superbly printed by Microscale without any registration issues. The instructions are first rate and offer painting information as well as a bit of history on the types. The nice thing about the sheet is that it provides common markings for all the options so you can build all four. It makes for a very interesting sheet and should stir some life into some older kits. Thanks to Yellow Wings for the review samples. You can get them direct from this link.